Morgan’s a lefty. Like that hipster outfit! We live in a right handed world. What seems normal to us may present many challenges for lefties who naturally figure out how to compensate and do fine in life. But wouldn’t it be nice if adaptations in our surroundings did not have to be made by lefties? Throughout history great thinkers, artists and performers have been left handed. Recently, post ‘dance party’, we noticed Morgan was having trouble cutting and writing with her right hand, switching back and forth to her left. We asked her which her dominant hand is, which really was obvious. I bought right/left handed scissors, both blunt and a little sharper, and three sided pencil grips. How your child holds the pencil, matters. In the photo notice Morgan is incorrectly holding her pencil which may make her hand ache as she writes more, so we will correct this. When we started tilting the paper, ‘just so’ (45 degree angle to her body), Morgan started to have a much easier time. 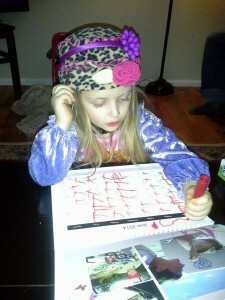 She is now writing like crazy, learning letters. At four now, developmentally she is “spot on” in reading readiness. But her mom, Rebecca, and I are figuring out how to best teach her as a lefty when we are right handed. As we got further into teaching Morgan to read, we wanted to make sure everything was set to go. Morgan faked us out that she needed glasses, so after an eye exam, she sometimes wears very cool frames with clear lenses that the optometrist gave her to be to be “big girl”. I read her the classics Arthur’s Reading Race (Marc Brown) and Dr. Seuss’ I Can Read with My Eyes Shut. She really liked those stories and we were relieved her eyes are ok. I think all kids need to have their eyes examined early, before they start making sense of letters on paper. If there are visual issues, I encourage you to seek out a specialist. See twitter.com/COVD, for helpful information regarding vision therapy. Morgan just happens to be a true lefty. Some kids don’t show their handedness until five, many as early as three years old. Back in the day, kids were switched, as grandma did with my husband. But he eventually ended up ambidextrous, as many left handed children are. I do not know what percentage. And left handedness figures vary anyway from 10-15% of the population, which is higher than I thought. We have several lefties on both sides of the family. How many lefties do you have? Teaching Morgan renews my interest in the topic of handedness, reading and writing. Most teachers are expert at teaching lefties, but as Nana, I am suddenly unsure what I am doing, although I taught lots of left handers. It makes me think about directionality in reading, affecting tracking the line of print, and fluency. If our language read from right to left like Hebrew or Arabic, it would be easier for these kids. Since children like to point to the letters and words, watch how comfortable your child is doing this. You may want to use a ruler or bookmark to place under the line of print. Perhaps sit slightly behind your child or where you comfortably see what’s going on. You need to think like a lefty. My daughter places Morgan to her left, or on her lap, so that Morgan can point with her own left finger. Rebecca uses her left finger when she is pointing to letters and words going left to right, because if she uses her right hand and crosses over, it confuses Morgan. Lefties need left handed modeling. To make sure I know what I am doing with Morgan, I have been observing, asking questions and doing internet research. I believe left handers have more issues than smudging ink. You often notice them dragging their hand through the writing, instead of the natural pulling a right handed child does. Frequently a lefty’s hand is covered with ink or marker from the dragging motion. Be careful where your child sits at the table or chair, tilt paper to the right, not vertically. Watch how your child holds a pencil, crayons or markers, so it is not “hooked” which hurts wrists. Posture also matters. Switch the mouse pad for your computer to the right side. Do simple things, to start. Reading starts with visual perception. This means the visual form of words is recognized, small details distinguished and printed symbols mean something. Goins, Kass and Vernon stated: “The individual must pay attention to the configuration of a word as a pattern having a sequence of letters and distinguishing characteristics”. This suggests a mechanical, visual/perceptual component of reading and may affect left handed children. Recognizing printed words requires that children notice a variety of changes in form, directional orientation or position in a line of print. A left hander has to find a point of orientation that is different from a right hander. Reversals are common to lefties. This is normal, so stay calm. Perhaps there is more to learning how to teach left handers than we have given attention to. Watch for my next blog about vocabulary and spelling , complete with printables. But just for today, let’s think about other factors affecting reading performance. I’d love to hear from you. As a lefty, I appreciate your sympathetic approach to teaching Morgan to read and write. I’m the only lefty in my family, and my mom never tried to “switch” me; in fact, she had harsh words for a teacher who attempted to make me use my right hand. I’ve never taught anyone to write, but I remember one of my teacher had us trace letters in the air before we put pencil to paper. This helped us practice directionality and sequence of motions, it was easy to see for modeling, and it was a no-pressure situation (it felt more fun than using a pencil). I wish you all the best of luck in Morgan’s reading and writing adventure!